Portadown manager Ronnie McFall says his side will need to improve their performance dramatically if they are to achieve a positive result against mid-Ulster rivals Glenavon on Tuesday. The sides meet in a rearranged Premiership match at Shamrock Park. "If we play like we did in the 3-3 draw with Dungannon on Saturday we will get nothing from the game," said McFall. "We need to take a long hard look at ourselves and up the stakes," said the Ports boss, whose side lie in sixth. 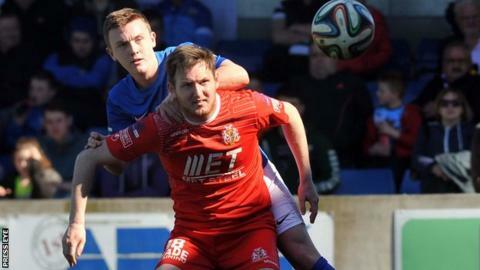 Glenavon are one point ahead of their opponents in fifth place in the table, but Lurgan Blues manager Gary Hamilton was happier with his side's display in a 2-2 draw with Carrick Rangers. "I was pleased with the boys' performance and application and I don't envisage making too many changes," said Hamilton. Elsewhere on Tuesday night, seven of the eight County Antrim Shield first-round ties will take place, with Cliftonville beginning the defence of their title away to Championship One outfit Ballyclare Comrades. Caretaker Reds' boss Gerard Lyttle has indicated that he will "tinker with his line-up a bit" for the visit to Dixon Park. Many of his fellow Premiership managers are expected to do likewise, with the aim of striking a balance between resting key players, giving other squad members a chance to impress and avoiding a potentially embarrassing defeat to lower league opposition. "I'll maybe fire in some of the younger players as youth is massive at our club and I want young, energetic players," said Linfield manager Warren Feeney ahead of his side's clash with Newington. "We have some injuries to assess but it's a competition we want to win so we will field a strong line-up," added the Blues' boss. Glentoran face a testing fixture against fellow East Belfast team H&W Welders at the Oval and manager Eddie Patterson has warned his squad to approach the game in the right fashion. "It's a classic case of a Premiership team against a lower league outfit trying to cause an upset so it's all about how we approach the game mentally," said Patterson. Crusaders travel across Belfast to take on Donegal Celtic, while Carrick Rangers are away to last year's beaten finalists Bangor. Larne face Sport and Leisure at Inver Park and Ballymena United meet near neighbours Glebe Rangers at the Showgrounds. "It's another distraction from the pressures of the League and we have a couple of players coming back from injury and suspension who need game time," said Sky Blues manager Glenn Ferguson. There will be coverage of all the evening's football on a Sportsound Special on BBC Radio Ulster MW from 19:30 BST on Tuesday 22 September.